Post your pics here for the pinnacle of the French BB line, the love child of the Iowa and Bismark! Last one is amusing. 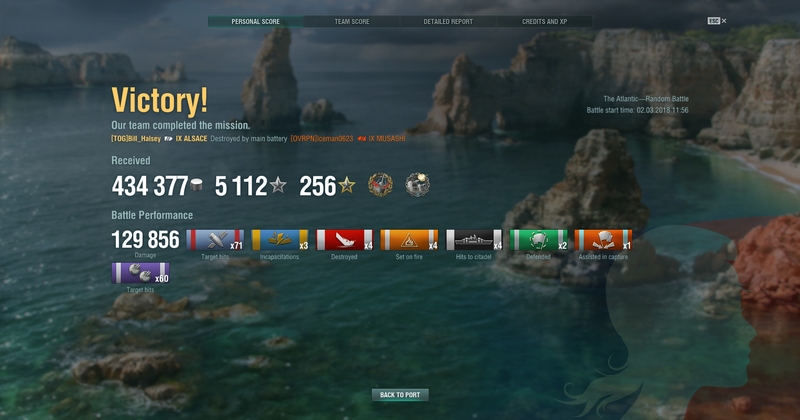 Mahan shown up and I killed him with the secondaries. Blys showed up 30 sec later. He immediately smoked. Secondaries got one salvo off before he disappeared. 10 sec later, voice announcing he died. 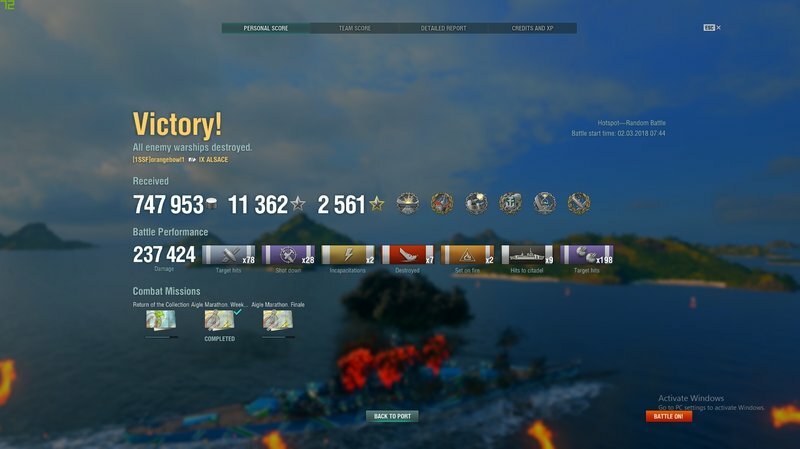 Only 1 shell hit, but that was enough. Lol. Then it was open season on me. Can't go wrong with the secondary build. I love that ship. The guns just sing, and the AA plus secondaries are sick. 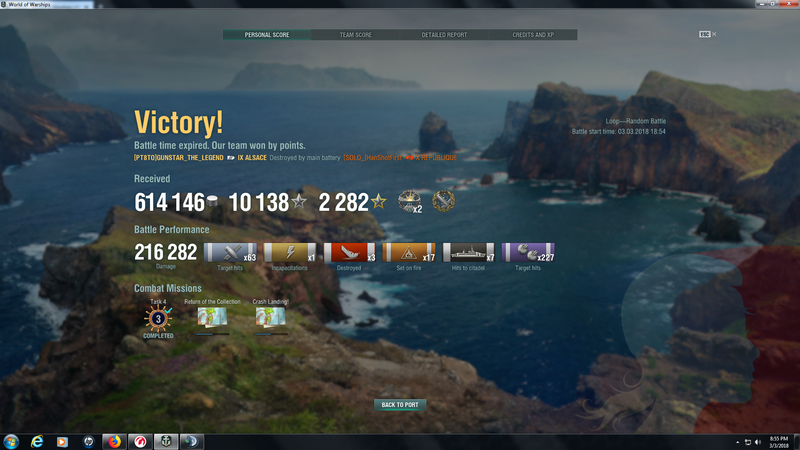 This ship reminds me of the Bismarck with the secondaries. 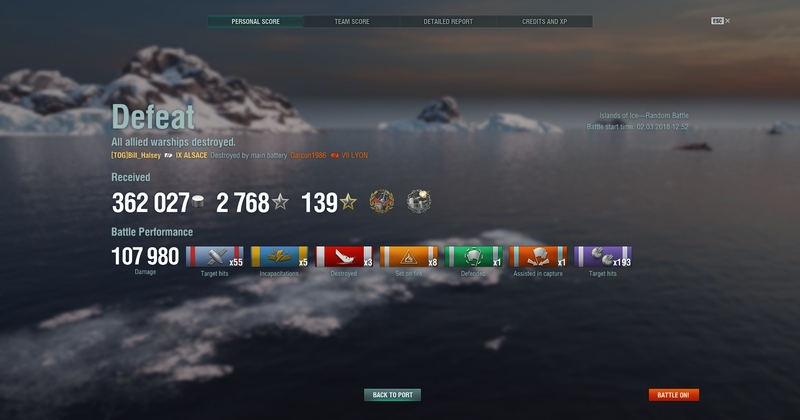 I loved it in the PT Server runs. I am still trying to grind up in getting this ship. 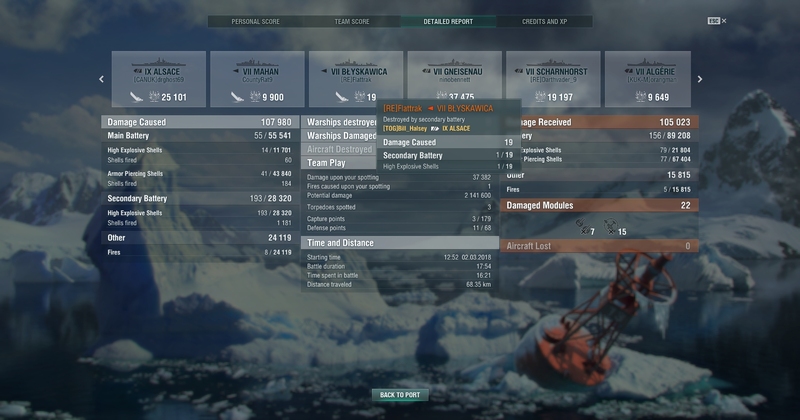 I hope WG didn't mess with the ship's stats much. Was that game before or after they nerfed the sigma to 1.7? The developers announced a change for the Alsace sigma from 2.0 to 1.7 back in December 2017. 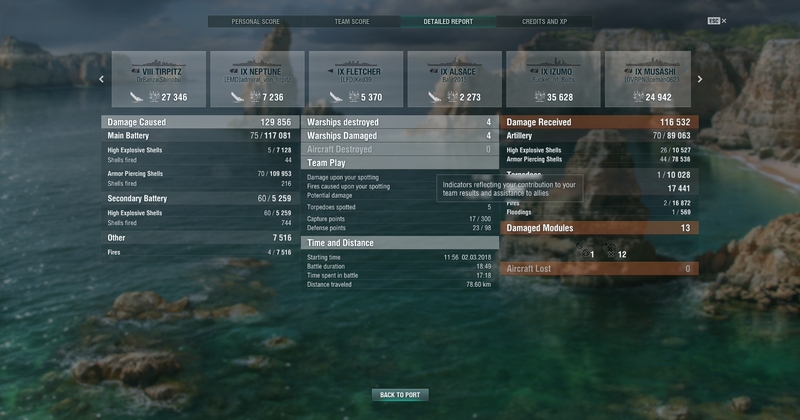 So I assume this match in the video is the 1.7 sigma version. Considering the max dispersion is 265m vs 314m for the richeleiu, 1.7 sigma is tolerable. Oh man wish id seen this Yesterday lol I will post some pics later today. Well it's 265m @ 20.3km for Alscae and the 314m is @ 25.3km for Richelieu. What would Alsace's dispersion be if it could shoot to 25.3km? Interestingly Alsace has the same max range and dispersion as FDG = 265m @ 20.3km. Aslsace has 12 guns and a 1.7 sigma and FDG has 8 guns and a 1.8 sigma. I play them both very similar, with secondary builds, and within the same basic ranges and I have a much better hit rate with FDG. FDG is not exactly known for being accurate either which speaks volumes as to just how inaccurate Alsace is. I prefer my Tier IX French girl with a submachinegun (Secondaries Build). Or to be more exact, with submachineguns. That's why I love the Alsace.